My kitchen smells like curry and simmering blueberries. 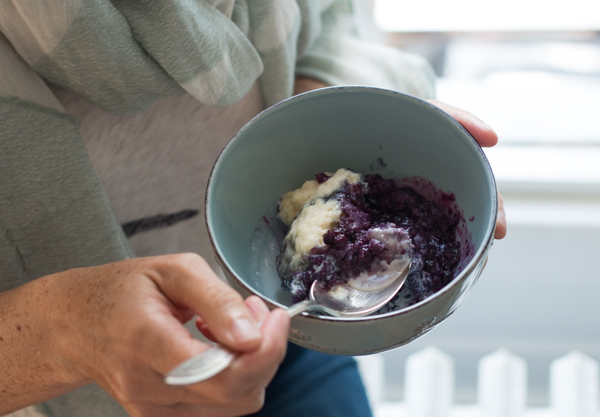 It’s a surprisingly nice combination: masala, turmeric and coconut in one pot, jammy blueberries in another, wafting up and melding into one. I like it so much I add a pinch of cardamom to the blueberries. I used to put those little seeds, native to southern India, in blueberry smoothies; the two flavours are good together. I’m cooking with my sister Sally. We’re two Wednesdays in to what I hope will be our weekly batch cooking sessions together. Sal had an infection in her heart over the summer. She’s on the mend, after 42 consecutive days of antibiotics, but she is still a little tired, and not sure how energetic her next steps should be. Time, and tests, will tell. In the meantime, we’re cooking and dividing it up. Pasta sauces. Curries. Chillis. Salad dressings. Blueberry Grunt – the things that make weeknights easier and Wednesdays more fun. The Blueberry Grunt was a special add on. Desserts weren’t part of the repertoire, but I had a stash of wild blueberries from our weekend in Cape Breton, and Sally and blueberries go well together. Blueberries for Sal, you see, was a favourite book in our house when we were little. Sally loved it for obvious reasons. I loved it because it involved the wild outdoors; a fun, mischievous child; a bear family and blueberries – all the things a little tomboy connected with. The story is all about getting ready for winter. A mother and her little girl set out to Blueberry Hill to pick blueberries. Wild grasses, boulders and low wild blueberry bushes cover the wind-blown landscape. The book is black and white, but I know it’s late summer, and those little bushes will soon turn a cranberry red. Sal’s mother tells her not to eat as they pick; they need to can the berries for winter. Meanwhile a mother bear and her cub also set out to Blueberry Hill. Sal and the bear cub meander away from their mothers as they eat and explore. Eventually they realize they are following the wrong mother (I loved this part – gasp!). I won’t give away the ending, but trust that by the end, Sal and her mother are canning blueberries, and the bears are full for the winter. Sally and I aren’t saving wild blueberries for winter. We’re more bear-like, more immediate. How could we not be? 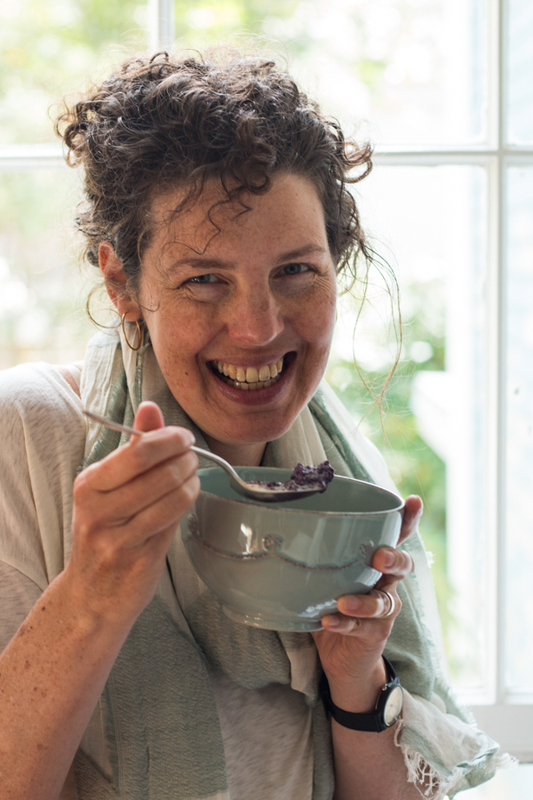 Last weekend my sister Lee served me a bowl of Wild Blueberry Grunt, topped with cream. She and her family are living in the Margaree for the fall, surrounded by ocean, salmon, rosehips and wild blueberries. I stood and ate it at the counter, like a bear. She picked the berries from bushes hiding amongst the tall grass in front of her house. If you look carefully, she said, the little blue berries will come into focus. So I started picking. Then I subcontracted my kids to pick as well – grass, leaves and all. Before we left, we had 4 cups worth. And this is why I have blueberries for Sal. “Sal, you have blueberries on your teeth,” I said. 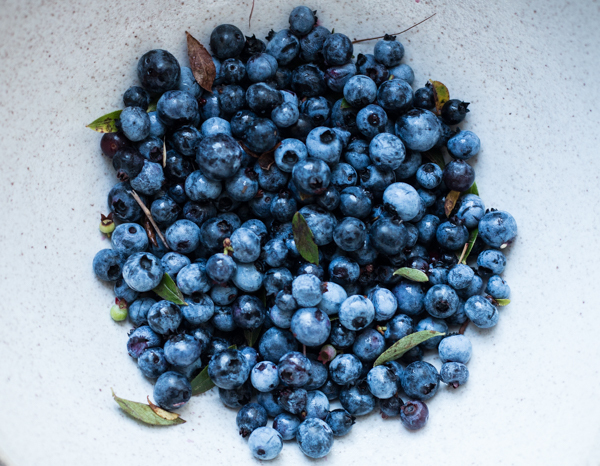 Blueberry Grunt is a stove top or camp fire dessert where blueberries are simmered in a pot with sugar until nice and jammy. Dough is spooned on top, a lid goes on, and steam cooks the dough, dumpling-style. Apparently the simmering berries make a grunting sound as their steam pushes through the dumplings. I’ve yet to hear a grunt, but maybe this happens over a campfire, when tinfoil covers the pan, a fire is licking below and people are extra hungry. Combine berries, sugar, water, cinnamon and cardamom in a large saucepan (or fry pan – either will do, as long as it has a tight fitting lid. Or use tin foil). Bring to a boil, then simmer until reduced slightly and berries become a little jammy. Add lemon juice and give it a stir. 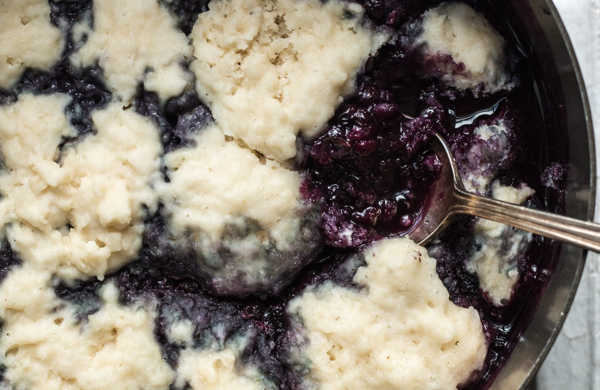 While the blueberries are simmering, whisk together the flour, sugar, baking powder and salt. Add the butter and roughly stir together, then add the milk. Stir until flour is no longer visible but mixture is still a little ‘shaggy’. Scoop into balls (golf ball -sized) and drop onto blueberry mixture. Cover tightly with lid and leave over medium-low heat to steam and grunt for 15 minutes. Don’t lift the lid. When the timer dings, prod a dumpling with a fork to make sure it’s cooked through. You want tender and fluffy, but not raw. Put the lid back on and simmer for a few minutes more if necessary. Eat warm, with a swirl of cream, while standing at the counter. Bear-like.